Paolo Tesio again showcase his latest work. This time, the Italian man's managed to turn a bike into a snow monster figure. Tesio who are graduates of automotive school in Turin have managed to change the look of the Ducati Monster ruthless which is specifically for snow terrain. Ice Ducati Monster name. Looks ruthless directly visible from the display wheels. Tesio accidentally change the rear tire with a larger size than the standard version is crammed on a Ducati Monster. 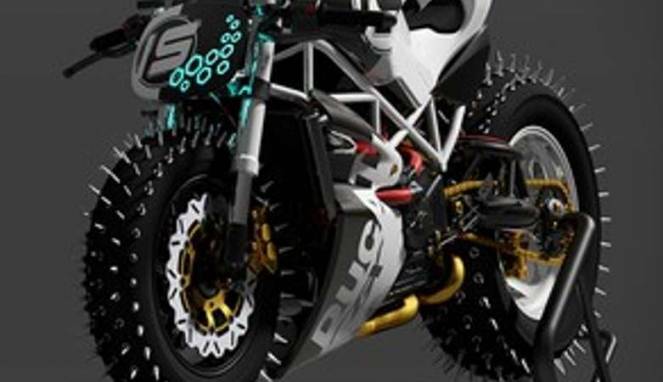 And that makes the bike look more extreme one, Tesio instill iron spikes on the tires. It is certainly to provide the grip power when the motor devouring snow terrain. With the arms Testastretta engine, the motor can spew frightening force of 160 horsepower. Although still limited to a motorcycle concept, but the motor Tesio draft is now ready to be tested.